Slice avocado in two, remove pit and cut into long slivers and set aside. Warm beans on low heat in small-medium sauce pan and simmer while preparing eggs. To add an extra kick to the beans, feel free to add a few dashes of hot sauce. Add butter to frying pan with medium-low heat and fry two eggs. While eggs are cooking, shred cheese. 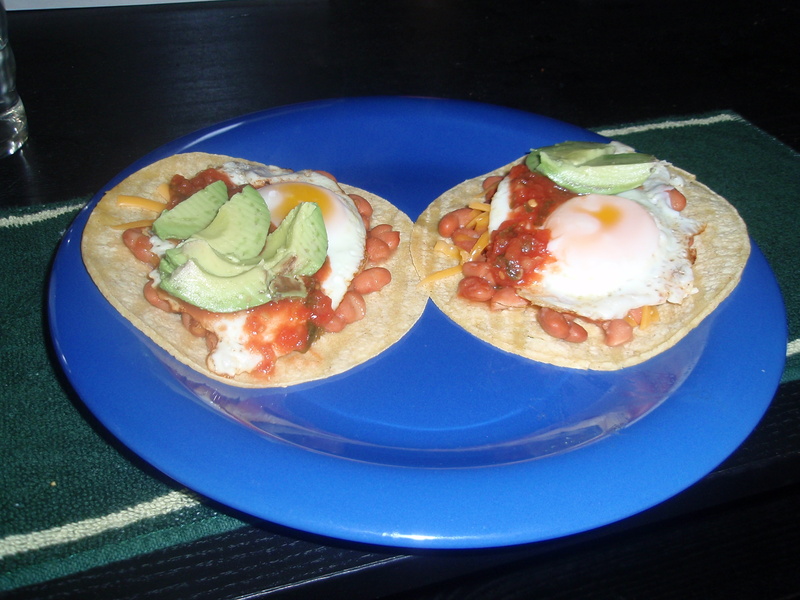 When eggs are done, remove from pan and add tortillas to the pan to heat. 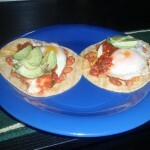 When tortillas are heated, place on plate, add beans, cheese and eggs on top. Add sliced avocado and salsa. To add a little more heat, add chipotle sour cream by mixing 1 Tsp adobo sauce and 2 Tbspof sour cream. Rub chicken with cumin, salt and pepper and grill on BBQ or cook on stove top in a large non-stick pan over medium high heat. 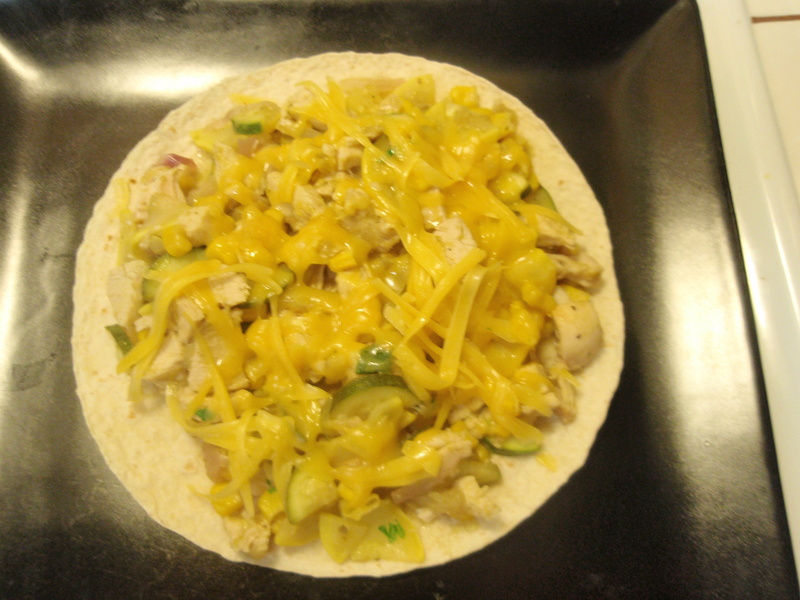 In another large non-stick pan, cook onion, corn, and zucchini/squash mixture. Saute for 3 minutes or until soft. Add cubed chicken from grill or pan. Stir in salsa and cilantro and cook until water evaporates, about 5 minutes. Stir frequently. Preheat broiler. Layer two tortillas at a time on a pan. Spray with cooking spray and broil for 3 minutes or until lightly brown. When all the tortillas are broiled, spoon chicken mixture and a handful of cheese in the center of the tortilla and return to broiler for 2 more minutes or until cheese melts. Continue with all of the tortillas. Sprinkle tostadas with cilantro and serve immediately.